The record-breaking Operation Lion Ark that began in Bolivia last November, ended on February 16 when 25 lucky lions touched down at Denver airport. Operation Lion Ark is the world’s biggest rescue and airlift of lions. It began with dramatic seizures across Bolivia as ADI worked with the Bolivian authorities to enforce their new law banning animal circuses. The ADI team seized 25 lions, some were extremely malnourished, skin and bone, dehydrated, living in overcrowded cages. One family of eight were all in a cage the size of a double bed. They were fighting to survive, taking food out of each others’ mouths. The stories are heartbreaking. Six monkeys, a coati mundi, a deer and horse were rescued and relocated in Bolivia or returned to the wild. This is the first national circus ban in South America and the world’s first ban on all animal acts. This is a world record for a lion rescue and ultimately a historic victory for animal welfare. It is a landmark in how strong animal protection legislation can be swiftly and effectively enforced. Bolivia has set a shining example to the world and we hope that Operation Lion Ark will have far reaching consequences, and encourage other governments to stand up and act, like Bolivia, to do the right thing for animals currently languishing in circuses throughout the world. This gargantuan task to end circus suffering in Bolivia started six years ago, when ADI field officers first exposed the cruelty in South American circuses. The shocking footage swept the continent, and in Bolivia the public were horrified by the conditions the animals were forced to endure. The exposé led to an educational and political lobbying campaign that gained early victories with animal circus bans secured in key cities and then after many attempts, the new law was secured on June 17, 2009. The circuses were given a year to dispose of their animal acts. One circus volunteered their animals, and ADI moved this first family of four handsome lions, Camba, Daktari, Bambek and Simba to the Performing Animal Welfare Sanctuary in California, and a Hamadryas baboon, Tilin, to Lakeview Monkey Sanctuary in England, in 2010. Our South America campaigns team in London and Bolivia began drafting regulations to enforce the new law, 4040. As this progressed it was clear that the remaining circuses planned to defy the law. This would be harder. ADI teams spread out across Bolivia locating circuses and conducting a census of all animals. When a lioness had cubs, the number of lions rose to 24 and it became apparent that this would be a huge operation. In November 2010, ADI circus search and seizure operations in Bolivia began. Ensuring an element of surprise we moved rapidly and, with the support of the Bolivian authorities, notably the DGB, Santa Cruz Governor’s office and police, staged raids on circus after circus. Our teams covered hundreds of miles each day; we provided the transport, cages, animal handlers, veterinary supervision, and all other animal care requirements. The circuses were very angry. There was much screaming, shouting, threats, and one circus owner came out with a knife – slashing the tyres of the transporter. Others tried to make a run for it. One circus kept moving, and then gave up, leaving their animals behind as they left town. One attempted to conceal monkeys, but we were alert and searched and found the animals. We received threats but stood firm. In the first week we closed 7 circuses. Only one remained, which kept on the move in an attempt to find ways around the ban. The circus continued to take the cubs into the ring and to parks for photos. Later named Bob, Nancy and Percy, they were the last animals to perform in Bolivia. We caught up with them in a remote town in the rugged mountain area where Ché Guevara once had his hideout. They attempted to barricade the beastwagons and threatened to assault the ADI directors leading the operation. But in the end there was little resistance: we took the animals. A more daunting prospect was the treacherous 18-hour drive through the mountains back to Santa Cruz! In less than three weeks we had removed all of the animals from every circus in Bolivia. The animal circus industry was shut down in a stroke. Mayor Percy of Santa Cruz donated land to temporarily house the lions. So, during the rescues we established our reception center, constructing security fencing, holding cages, installing running water, electricity, and veterinary facilities. It was here that the lions were nursed back to health, put on weight, built up their strength and had veterinary treatment. One of the family of eight who were crammed into that small cage was poor little Campeon, a young male. His front legs crippled with bone disease, he was too weak to get into the wagon that would take him from the circus. Our vet feared Campeon might not survive, and during the journey to freedom he collapsed; it was terrifying; we worked desperately to revive him – then finally, after what felt like an eternity, he got to his feet. Since then, Campeon has grown stronger every day; the joy on his face when he got his first toys, footballs and logs, was something to behold. It will be a long road, but we are all crossing our fingers that this brave little lion will get stronger and stronger. These lions lived in bare cages, with nothing to do, nothing to interest them. When we gave them hay for the first time their sheer joy at having something to touch, sniff and roll about in was truly amazing – they cuddled the logs and tyres we gave them to play with, and within hours they became different animals. These animals had endured a horrific life, so our veterinary team led by Dr Mel Richardson, with Jimena Delgado in attendance daily, were regularly dealing with crisis. 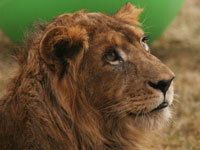 Lion number 25, Kimba, arrived in early February. Once owned by a circus, he had been dumped in a small zoo due for closure, some eleven years earlier and had been alone since. He was in Tarija – a 48 hour drive each way. So we booked space on an old C130 Hercules and flew down for him. We had to smash down a wall and hack through his cage bars to get to him, but we quickly lured him into his travel crate. On arrival at the reception centre, this grand, old, peaceful lion heard the roars of other lions for the first time in all those years and roared back. Back in the US and UK a special appeal to raise funds for the rescue and lifetime care for the animals was launched. Jorja Fox (CSI’s Sarah Sidle), and celebrity TV presenter Bob Barker, whose substantial support made the project possible, backed the appeal along with Twiggy, Brian Blessed, Joanna Lumley, Julia McKenzie, and Benjamin Zephaniah, along with Meg Mathews, Wendy Turner Webster and Prunella Scales. The most efficient way to move the lions would be all at once and we secured a home for all of them at the Wild Animal Sanctuary in Colorado. With ADI funding, construction began immediately on a huge biosphere to house the lions as they acclimatised. Back in Bolivia, travel crates were built, including a special mother and cubs crate. Torrential rain made the roads impassable and the ADI team had to work soaked to the skin, pulling down the rain covers to protect the lions. It began to look like the whole rescue could be washed out. But the sun came out on loading day and spirits rose. Loading 25 lions was a challenge. An hour per lion was not an unreasonable estimate – but that would mean a lion in a crate for 24 hours before even leaving. We had to do better. We split into two teams. All well drilled, professional and great affection for the lions, the teams worked in near silence, coaxing the lions in with food. Loading took just six hours. At midnight we headed to the airport. We had a TAB Airlines DC10 rented at a discount price and crew all had ADI logos on their uniforms for the day. Thanks to the ON Group who helped and were at our side at every step on this final stage. Our meticulous plan to have all the lions in colour-coded crates denoting family groups made sure everyone remained calm. There had been continuous media in Bolivia and at Denver International Airport there was more, with Jorja Fox and Bob Barker there too. The video of the doors opening and Jan punching the air before the lions were unloaded raced round the world. The huge extended pride that arrived in Denver are the adorable cubs Percy, Bob and Nancy and their mother Kiara; the beautiful girls India, Chitara, Dalila, Kenya, Muñeca, Lulu, Panchula, Fida, Marta, Maria, Morena; and the naughty youngsters, Rosita, Rosario, and Rosa; and the magnificent males, Temuco, Pancho, ColoColo, Kimba, BamBam, Hercules, and young Campeon. All the families are now in the specially-designed 10-acre biosphere with natural sunlight, grass and trees whilst they acclimatise. When they arrived, they ran and frolicked, they had grass beneath their feet for the first time in their lives, and they loved the pine trees. A thrilling reward for the months of preparation. As summer arrives and the outdoor enclosures are finished, they will have free access to a further 70 acres. At the sanctuaries in Colorado, California and the UK, construction has been paid for by ADI, and all three are receiving payment from us for the lifetime care of the animals. These lucky lions have been on the journey of their lives, taking them from cages on the back of trucks, being forced to perform demeaning tricks, to an expansive natural enclosure at a state of the art facility near Denver. Operation Lion Ark was logistically complex and expensive. Now we need your help to keep our promise of a bright new future to the lions. The suffering and years of neglect these animals have endured has taken its toll. Many require extensive dental work – broken, infected, painful teeth, even abscesses. It is hard to imagine the pain they have lived with for years. And, we need to feed and provide veterinary care for up to 23 years. We are urgently calling for donations to provide the specialised dental surgery required for many of the lions, for any other surgeries or treatments. This is such an important rescue mission because it shows South America and countries all over the world that if they pass strong laws to end cruelty, then ADI will be there to help ensure they are enforced. Too often have there been laws full of promise, heralded as victories, but simply never enforced because of lack of resources. Not this time. There are no animal circuses in Bolivia. Dear India, dainty, sweet-natured, timid, at first afraid to enter her temporary enclosure in Santa Cruz, because she had not seen a lion since being taken from her mother. Now, she is part of a pride of five. Campeon, the little lion with his twisted legs who almost didn’t make it, now so full of fun running and playing with his boistrous family. Quiet and gentle Kenya, her circus cage was the size of a cupboard with solid walls, put in there as a cub, never to come out. Exquisite ColoColo the angry lion, who reacts so aggressively when he sees a shovel or stick, but who can blame him? Now his teeth have been fixed and he can spend his days with his family, Muñeca and Lulu. Nobody is going to come near him with a stick ever again. Sweet Kiara and her three cubs, safe at last. Her cubs will never be taken from her again. These lucky animals symbolise the work of ADI. All of the costs of rescuing these animals, including the investigation, the legislation campaign, rescue itself, the sanctuary enclosure and habitat materials, food and veterinary care, have been covered by ADI. We urgently need supporters to adopt some or all of our rescued animals – call 020 7630 3340 for details. This was a rescue for life!